A Conversation with Mike Elliott at TechnoServe – promoting sustainable mobile solutions for farmers. TechnoServe is a non-profit organization that seeks to alleviate poverty in the developing world by partnering with enterprising people, to create and develop businesses that can generate income and jobs. TechnoServe has operated in Kenya for four decades, helping build capacity for more than 500 small and medium-sized businesses. In addition, it is helping thousands of farmers “boost their incomes and connect to broader markets”. In its role as a catalyst, TechnoServe is now promoting sustainable mobile solutions for agriculture development through the Connected Farmer Alliance (CFA), which began in October 2012. We recently spoke with Mike Elliott, Director of the CFA project at TechnoServe, Kenya. Hello Mike, can you tell us a bit about TechnoServe and its work in Kenya? Kenya’s has witnessed a period of recent stability, with increased credit access to the private sector, investment in infrastructure, and growth in key sectors such as tourism, renewable energy, and information and communication technology (ICT). At the same time, unemployment and poverty rates in the country remain high, with 35 percent of Kenyans living on less than a dollar per day, and food insecurity looms large due to poor farming methods and vulnerability to drought. TechnoServe is looking to address these challenges through market-led approaches. Currently, TechnoServe is focusing on livestock, coffee, horticulture, food processing, sustainable mobile for agriculture development and entrepreneurship development, with an emphasis on engaging the youth and women. What is the Connected Farmers’ Alliance (CFA) and what does it do? The CFA is a 3-year partnership between Vodafone, USAID, and TechnoServe focused on developing mobile solutions for agriculture. For us that falls into three categories: 1) mobile supply chain solutions that enable agribusinesses to engage more effectively with their smallholder suppliers, 2) mobile financial services to that smallholders, including savings, insurance and credit, and 3) identifying and supporting entrepreneurs that are engaging in the mAgri space. With the Vodafone partnership, we are testing a model whereby private sector players can engage profitably and sustainably in the agriculture sector. At TechnoServe, we are doing the ground work to make sure it’s successful. For more information, see connected farmers alliance. For USAID and TechnoServe, engaging the private sector in program is a way to ensure long-term sustainability. The work that CFA is doing in developing and scaling products will continue after the program ends, as the commercial products will be embedded in our local Vodafone partners where they will receive continued focus and investment. As for why Vodafone specifically, they’re really committed to agriculture, and understand the value of working with stakeholders like NGOs and the public sector. They’re making a significant investment in this space, and are bringing the managerial focus required for us to be successful. In addition, we get to leverage the M-Pesa system, a mobile money platform that Vodafone pioneered and is now leveraging for interesting and innovate uses. How are you going to gauge the success of the CFA program? Well, there are two main success criteria. First, the products we develop must be launched and commercially supported in the market by Vodafone and their local partners. This will prove our business model, and ideally crowd-in other players in the mobile agriculture space. Secondly, we would like to engage half a million farmers through our products by the end of the program. What projects are Kellogg-CRTI Fellows involved with at TechnoServe for the summer? Nirav is engaged in designing two mobile financial services that will address the unique needs of women farmers. Women do a large proportion of work on the farms but have a lower degree of control over the production. He has been conducting field and desk research and holding focus groups of women to inform potential solutions. At present he’s identified two potential products and is building out the business case and pitch deck that will enable us to find a home for these products. Preeza is identifying ways that a local tech incubator can better support entrepreneurs looking to develop Value-Added Services (VAS) for agriculture. She has developed a suite of services and events towards this end, and is embedding these within Safaricom, TechnoServe and the incubator itself. Greetings from Mumbai! It’s amazing that it’s almost the end of summer (and, sadly, the end of the CRTI Fellowship), but it’s been an action-packed last couple of months out here in India. Unlike the rest of this year’s CRTI Fellows, I opted to head to India, and have spent my summer working with fellow CRTI-alum Bryan Lee’s company, Krishi Star. Getting here proved to be a little difficult, with a longer-than-usual visa turnaround process, and then a stressful few days trying to find proper housing, but I quickly settled into the city and the job. On the work front, I’m working for Krishi Star, whose mission it is to improve the lives of impoverished rural farmers in India. We’re doing this right now by partnering with farmer-owned small businesses (food processing units, in particular), and utilizing their excess capacity to process whole peeled tomatoes, which are then marketed and sold under the Krishi Star brand. The company has already done a few production runs of the whole peeled tomatoes, and we’re looking to ramp up production again in a few weeks once tomato prices stabilize (it has felt like the biggest news ever here at Krishi Star, but in case you’ve not seen in the rest of the world, Indian tomato prices have gone a little crazy lately). Just as importantly, though, the company is also looking to expand into new products and new markets, which has been the focus of my Fellowship this summer. As we grow the business and prove out the front-end model of working with farmer-owned processing units and marketing under the Krishi Star brand, we’re actively looking to identify the next important product or crop. The entire team has been focused around identifying what that next product/crop will be, what market channel we’re going to focus on, how we’re going to connect the back-end to get it produced, and how we’re going to drive it to as many customers and consumers as possible. My main focus for the summer has been leading this process, guiding the other interns (some local, some from other US schools) and FTEs through market research and business strategy. Outside of work, Mumbai has been an amazing experience, and certainly one I wouldn’t have been able to fully appreciate without the opportunity provided by the CRTI Fellowship. I’ve seen as much of the city as possible (a tall task in a metro area of over 20 million people), and have assimilated into the local forms of transportation, taking trains, buses, and rickshaws everywhere I need to go. With one week left on the clock, I’ve got a fair bit to finish up, but all-in-all things have come together pretty well this summer. It’s an exciting time for the company, with a number of big things on the immediate horizon, and it’s been a great privilege to have been a part in shaping our future. This final weekend will be an amazing culmination of the summer, with a team trip out to the rural areas of Gujarat, visiting farmers, farmer-owned producer companies, and a few other key contacts that will help to grow the business. I didn’t know what to expect from this summer when I finally landed in Mumbai (which makes it easy to say that it’s exceeded my expectations), but looking back, I can say that there’s nothing I would have changed. The ups and the not-so-ups; the work and the outside-of-work; the commuting and the exploring. All of it made for an unforgettable CRTI Fellowship. All the best from Mumbai! In the summer of 2011, Kellogg School of Management (http://www.kellogg.northwestern.edu/) student Bryan Lee embarked on a summer trip to India after being awarded a Fellowship by Kellogg’s Center for Research in Technology and Innovation – CRTI (http://www.kellogg.northwestern.edu/research/crti.aspx) . For ten weeks, Bryan worked at I-Farms Venture Advisors, an organization that partners with entrepreneurs to create scalable and socially responsible businesses in the food and agriculture space. The CRTI Fellowship served as a catalyst for Bryan’s post MBA goals and desire to work in international development. Today, Bryan is co-founder of Mumbai-based Krishi Star (http://krishistar.com), an enterprise that aims to alleviate poverty for Indian farmers by giving them ownership in the food chain and access to broader markets. We caught up with Bryan recently who spoke about his Fellowship experience, social enterprise and hopes for Krishi Star. Q. What prompted you to apply to the CRTI Fellowship in 2011? A. Bryan Lee: I really could not have designed a better internship opportunity for myself than what the CRTI Fellowship offered me – Social Entrepreneurship + International Development + myriad of opportunities the program offered to meet NGOs/Social Enterprises during the course of the fellowship + getting to travel with a batch of fellow classmates. I could go on and on. It was exactly what I had been looking for, but due to the nature of the social enterprise space (read: very few paid opportunities) I had been having a lot of trouble finding. In fact, you could even judge how perfect it was by the sheer number of my friends/classmates that forwarded the fellowship announcement over to me the day it was released. My inbox was full! Q. What did you take away for the ten weeks spent in India in 2011? A. Bryan Lee: I left India with exactly what I had gone there for – inspiration. I told myself before I went on the internship that I wanted to touch all of the spaces I was interested in (international development, impact investing, social enterprise) and come back knowing what I wanted to do post-graduation. That is exactly what happened. I came back to Kellogg the next year committed to moving out to India and starting up what is now Krishi Star. Q. What do you hope to accomplish at/with Krishi Star? A. Bryan: We want to build an enterprise that can end poverty at scale in India. There are almost 200 million farmers living in poverty here, which means there is a lot of scope for impact! Q. Can you explain how Krishi Star is helping to end poverty for Indian farmers? A. Bryan: We aim to lift small farmers out of poverty by providing them opportunities to become owners of a larger part of the food value chain. Finance and marketing are often key roadblocks to this for these farmers. However, what seems like a disadvantage can actually be turned into an advantage when you consider the possibilities that exist when you bring together large numbers of small farmers. We set up investments for farmers to become owners of food processing units and then market their products through a brand that represents them. By repeating this process through the injection of commercial capital, our vision is to create a system of farmer-owned processing units which will greatly increase and stabilize rural incomes. Q. Does this play into your vision for bringing about social change? A. Bryan: My experiences with CRTI and my subsequent work with Kellogg Corps in Ecuador led me to believe that one of the key starting points to ending poverty at scale in emerging/developing economies is to address rural poverty. I remember thinking back to my Microeconomics classes while I was in India and realizing that if you were to take all of the guidelines we were being taught about what is a favorable economic position to be in, small farmers were pretty much at the complete opposite end of the spectrum. Small, inefficient producers, commodity markets, volatile production environment, no market power, the list goes on and on. We want to transform the economic conditions for these farmers. Congratulations 2014 East Africa Fellows! From left to right – Nirav Patel, Natasha Shih, Preeza Shrestha, and Fiona Handayani. Kellogg School of Management students Nirav, Natasha, and Preeza are working on projects with TechnoServe while Fiona is getting her feet wet at One Degree Solar. Good luck to them for the summer! In the coming weeks we will feature the work being done by these organizations. Over the past four years, CRTI Fellows have undertaken summer projects at various social enterprises and NGOs in the developing world. Our inaugural batch of Fellows left for India in the summer of 2011 with a strong desire to assist organizations dedicated to catalyzing social change in fields ranging from livelihood and education to agriculture and health. They spent ten weeks in New Delhi’s stifling summer heat working to help enterprises such as Drishtee, iFarm, d.light, and the American India Foundation. Drishtee (www.drishtee.com) is a social enterprise that works with marginalized communities and supports rural enterprises particularly micro-franchising. CRTI Fellow, Tobias Hurlimann, worked with Drishtee and developed a framework that organizations could use to assess micro-franchising opportunities in developing countries, determine the infrastructure and services needed, and the key success factors in operating a micro-franchise. This framework was the culmination of many weeks that Tobias spent interviewing Drishtee’s management, franchises, and entrepreneurs as well as findings from secondary research. More to come about other Fellows and projects in subsequent posts. In 2011, Professor Mohan Sawhney, founder and Director of the Center for Research in Technology and innovation (CRTI) at the Kellogg School of Management, launched a summer Fellowship program. Dubbed the Innovation in Development Fellowships, the program sought to advance the Center’s research in the uses of technology to enhance social and economic development in developing countries. A maximum of ten Fellowships was offered to first-year full-time MBA students interested in gaining an understanding and real world experience of the issues confronting social enterprises in the developing world. 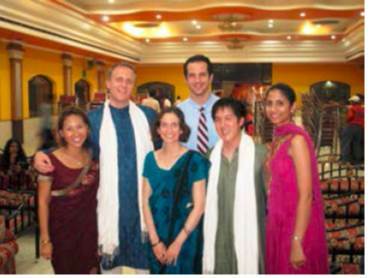 The first program in 2011 began with six Kellogg students undertaking their Fellowships at various social enterprises in India. Two years later, the program was expanded to East Africa, primarily Kenya. This year, we are excited to welcome five talented Fellows, four who are heading to Kenya and one to India. Good luck, Fellows!